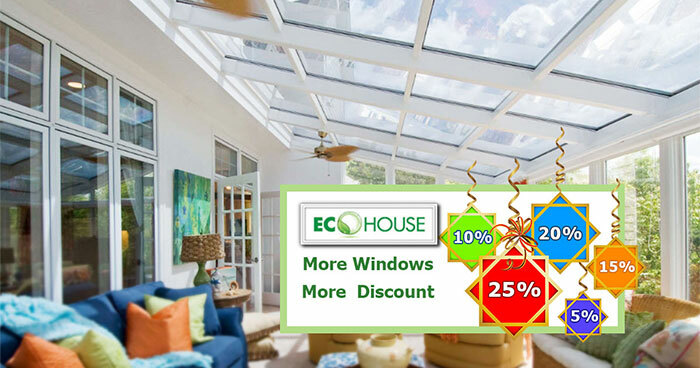 DECEMBER offer: "Great Discounts on ECO HOUSE PVC windows!" Only in December 2018 if you pay 100% on the day of the order you will get an additional 10% discount. The total discount when paying for the order can be 15%, 20% or 25% ! The basic discount depends on the number of windows in the order: up to 5 Windows - 5% discount, from 6 to 10 Windows - 10%, more than 10 Windows - 15% discount. *This price offer is valid only in December 2018. Execution of the order in the white profile of any type of opening, with any glass or glazing. Order is completed within 35 days. Prepayment when ordering, 100% of the cost. We have already made fifty three steps towards to our customers. And today it's the time for our FIFTY FOURTH STEP.